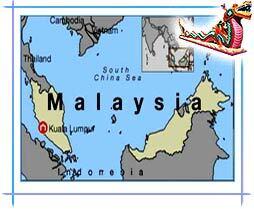 Here is given information on geographical location of Malaysia. Know more about Malaysia's geography and location. Amidst South China Sea, Malaysia is strategically sited in the Southeastern Asia. This beautiful country, with an area of 329,750 km², has two separate parts - Peninsular Malaysia and East Malaysia. As the name suggests, East Malaysia is to be found in the East, whereas Peninsular Malaysia is located in the West. The southernmost tip of continental Asia is marked by Tanjung Piai, a cape positioned in the state of Johor. Placed between Sumatra and Peninsular Malaysia, the Strait of Malacca is possibly the leading shipping lane on the planet. The South China Sea separates the two distinct parts of Malaysia. However, both the parts have coastal plains which rise to heavily forested hills and mountains. Thailand, Singapore, Straits of Malacca and Indonesian island of Sumatra share their borders with the Peninsular Malaysia on the north, south, west and east respectively. Peninsular Malaysia bears the weight of granite, stratified rocks, other igneous rocks and alluvium, at various locations. In the East, Malaysia finds its highest point of elevation (4,095m) at Mt. Kinabalu. Located on the picturesque island of Borneo, East Malaysia is happily sharing its southern borders with Brunei and Indonesia. To its west and north, East Malaysia is embraced by the South China Sea and by the Sulu Sea on the northeast. The major area of Malaysia comes under East Malaysia, with approximately 60% of area. More than 50% of country's total area is covered under thick tropical forests, particularly in Sabah and Sarawak.